Google announces Pixel 3, Pixel 3 XL, and Pixel Slate! Home / google / mobile / news / Google announces Pixel 3, Pixel 3 XL, and Pixel Slate! Google has just announced two new smartphones: Pixel 3 and the 3 XL and surprises us with a new tablet, the Pixel Slate! The new Pixel 3, 3 XL! In an event held in New York City, Google has announced the latest from their products and services. These include their popular Pixel line of smartphones that is now on its third iteration. 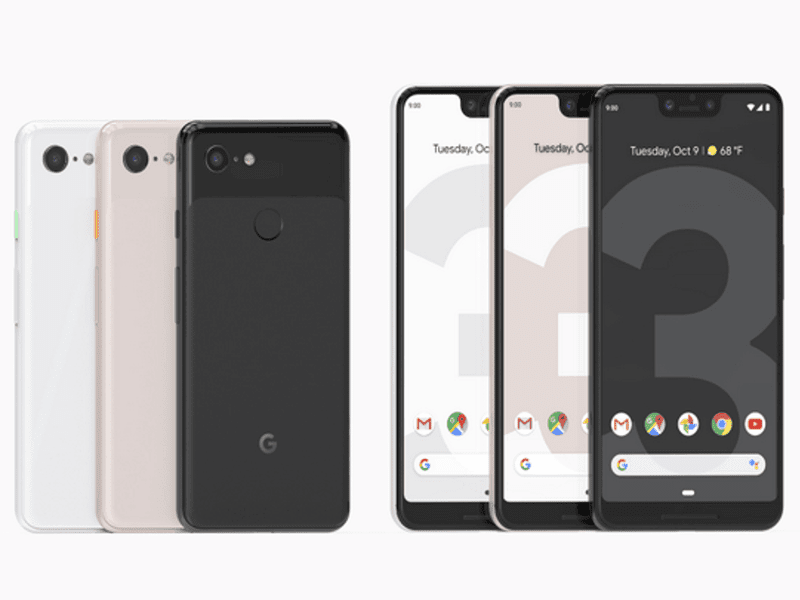 The new Google Pixel 3, Pixel 3 XL are both running on Android 9 Pie with the Snapdragon 845, Pixel Visual Core, 4GB RAM, up to 128GB ROM. Both phones carry a 12.2MP f/1.8 rear shooter with OIS and PDAF while the front facing camera is an dual 8MP f/2.2 fixed focus lens with 97-degree of field of view. Both phones also come with stereo speakers, USB Type-C, 18W USB-C charging plug, Qi wireless charging support, and rear fingerprint sensors. The new Pixels are Gorilla Glass 5 protected as well and both models come in just black, very white and not pink. The Pixel 3 comes with a 5.5-inch OLED 1080p display with 18 x 9 aspect ratio and will be powered by a 2915mAh non removable battery while the larger Pixel 3 XL comes with a huge 6.3-inch OLED 1440p display and 3,430mAh battery. Neither have a 3.5 mm headphone jack but both come with a USB Type-C to 3.5 mm headphone adapter! Google also surprised us with a new tablet, the Pixel Slate! Front and center of this tablet is a 12.3-inch 3000 x 2000 LCD with multi-touch and Google Pixelbook pen support that goes up to 400 nits. It features front facing stereo speakers and is powered by either Intel Celeron/8th-Gen Core processors up to an i7! Storage options are up to 16GB RAM and 256GB of SSD storage. 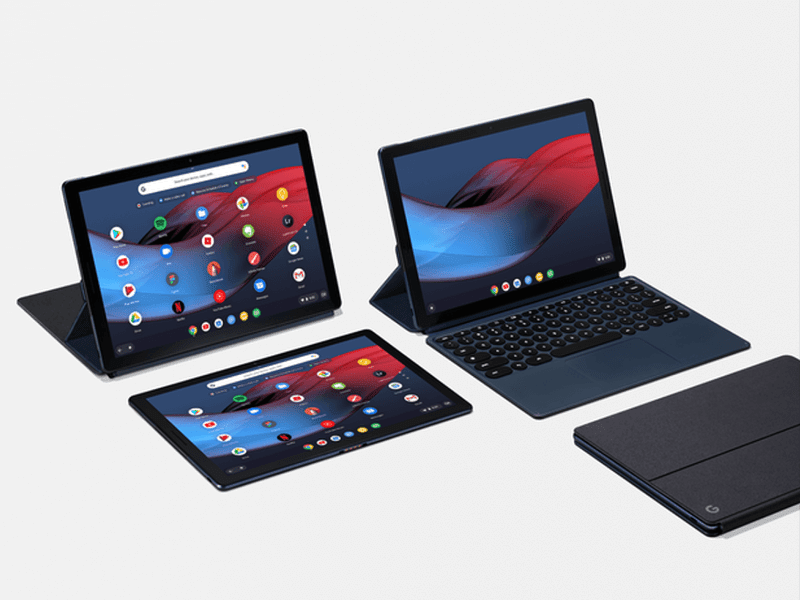 Port selection is limited to two USB Type-C with charging and 4K display-out and data transfer support and the connecting port for the Pixel Slate keyboard. It has one 8MP front facing camera and connects via WiFi 802.11 AC and Bluetooth 4.2. The color only comes in midnight blue with Corning Gorilla Glass details. The prices of the new smartphones! 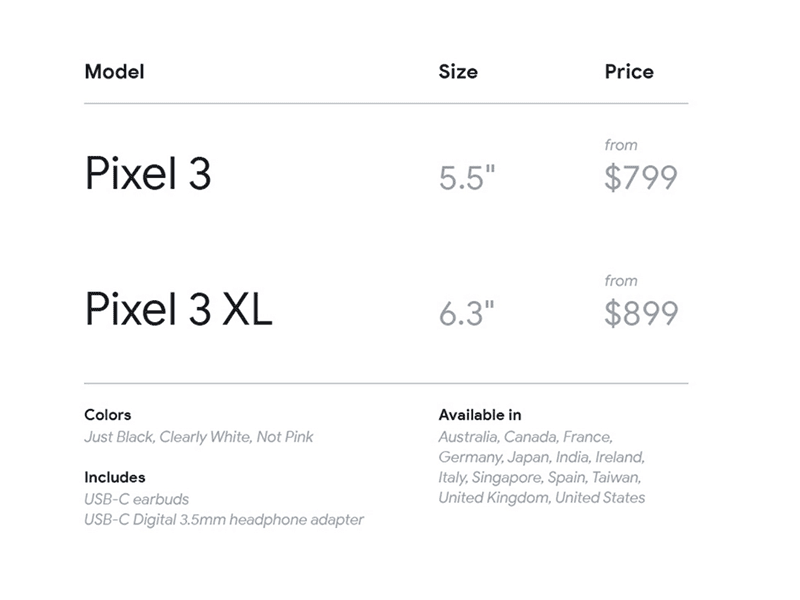 The Pixel 3 starts at USD 799 while the larger Pixel 3 XL will cost 899. The Pixel slate starts at 599 and will set you back another 199 for the keyboard but availability will be updated as more information is released. Japan, Taiwan, and Singapore are the nearest countries to have it.